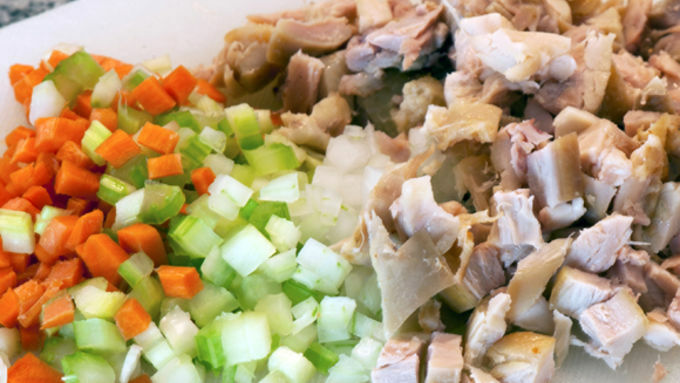 Chop up the chicken and vegetables. Cut the boiled eggs in half. Remove the yolks, and place in a medium sized bowl. 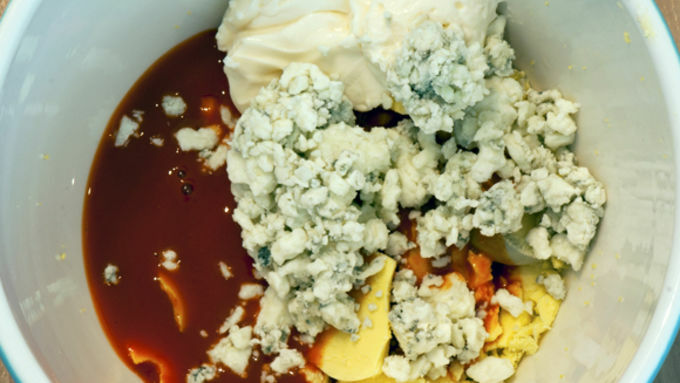 Add the Yoplait® Greek yogurt, wing sauce, and 1/4 cup of the blue cheese (reserve remaining). Stir until well mixed. 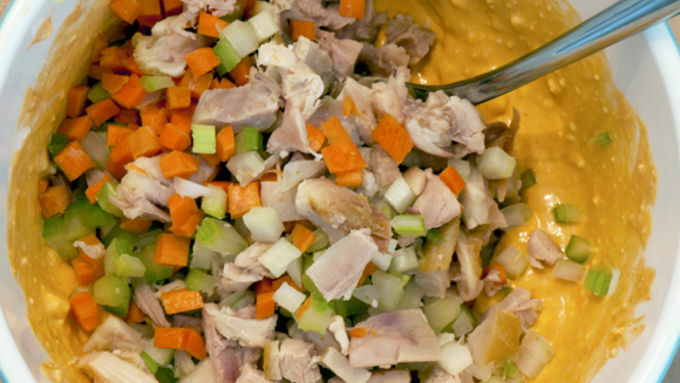 Stir in the chopped chicken, carrots, celery, and onion. Spoon the chicken mixture into the egg white halves. Before serving, add a drizzle of wing sauce, the remaining blue cheese crumbles, and a sprig of parsley. Get your Ron Swanson on and enjoy! There are days, and then there are days. 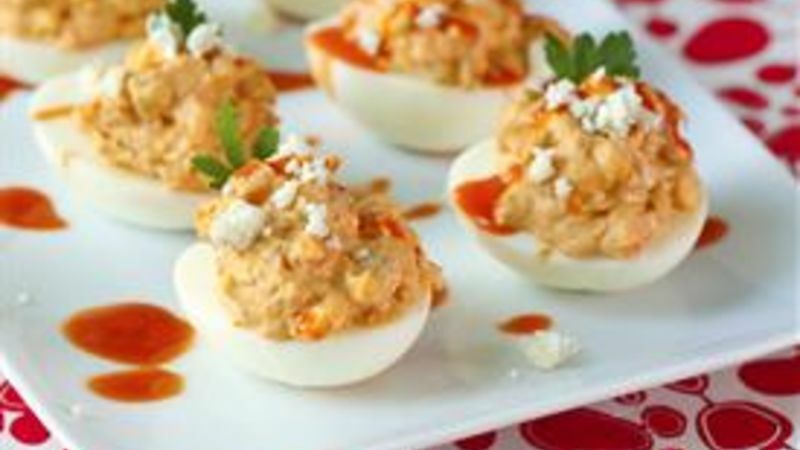 This Buffalo Chicken Deviled Eggs recipe is a favorite for those that are, well, DAYS… Not only is it one of the most delicious, crowd-pleasing appetizers ever, but the whole shebang takes only minutes to toss together–and the ingredients are things I usually have on hand: eggs, a rudimentary veggie, Greek yogurt and wing sauce. (Yes, it’s true – I don’t always make my own wing sauce. Well, truth be told, I’ve made my own wing sauce once. It was great, but you know how it is …) Ease and convenience aside, let’s get down to the heart of the matter. Who wouldn’t want to channel their inner Ron Swanson with a little ultra delicious Buffalo Chicken Deviled Egg action? I am completely obsessed with the Swanson character on NBC's Parks & Recreation. He's a bit of a foodie in his own peculiar - and yes, deviled egg obsessed – way. In my quest for Swanson-worthy deviled egg perfection, this wonderful recipe inspired me. I made a few alterations necessary for Swansificiation – deep-sixed the cucumber (I just can’t see Mr. Swanson eating a cucumber, cool and refreshing as they may be) and swapped the canned chicken for fresh (I truly don’t know which side of the line Mr. Swanson would fall, however, I usually have on hand leftover chicken on hand). I did make one departure from a Swanson approved ingredient. The mayonnaise was swapped out for a little Greek yogurt. It’s still delicious (and with the frighteningly copious amounts of animal protein consumed by the character, perhaps a timely and necessary alternation), and I swear he wouldn’t even notice. I certainly wouldn’t mention it. For me, I would say that the swap very nearly justifies the blue cheese…or extra blue cheese. But you can use mayo if you like.